Ultrasound or fluoroscopy guided steroid injections are techniques where the injection of drugs, in this case steroids and local anesthetics, are performed with the guidance of medical imaging techniques. Ultrasound provides real-time images of internal body structures such as bursae, joints, muscles, nerves, tendons, blood vessels and internal organs; whereas fluoroscopy provides real-time images of bones. This visual guidance is used when there is need to administer a drug to a very specific location. Ultrasound or fluoroscopy guidance allows the direct visualization of the tip of the needle in real-time as it pierces the skin to the point at which the needle enters the target site, thereby increasing the accuracy of the injection. Without this visual guidance, injections are more prone to misplacements. 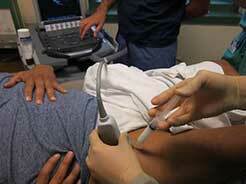 By being more precise, ultrasound or fluoroscopy guided steroid injections are also usually more effective. Steroid injections are commonly used to treat pain conditions, but sometimes they have poor efficacy. This lack of effect can, in some cases, be due to a poorly located injection. Ultrasound or fluoroscopy guidance helps overcome this issue. Ultrasound or fluoroscopy guided injections are used in the treatment of multiple pain conditions that require a localized administration of steroids. Steroids are a class of medications that are related to cortisone. Steroids have a powerful anti-inflammatory action. They are used to reduce the inflammation caused by a variety of diseases.